I must admit I didn’t pay much attention to those countrys’ names until the recent football World Cup. It was also the first time in my life I bet on football (Singapore Pools) probably influenced by the prediction by that octopus Paul. I first got startled by the Channel 8 news when it showed “Holland vs xxxxx”, then the next moment it showed “Netherlands vs xxxxx”. My mind suddenly went ‘blank’ and quickly refleshed my mind to think if they meant the same country like what I’ve learnt in primary school then – Sri Lanka is the new name for Ceylon. I checked with my son who is in Sec.4 now (probably his teacher might have taught him), and he said he was not sure and his teachers have yet to touch on that…. (maybe after World Cup final). I’m wondering why from the same source (Channel 8 in this case), 2 different names were used? Is Netherlands the new name for Holland like Sri Lanka? 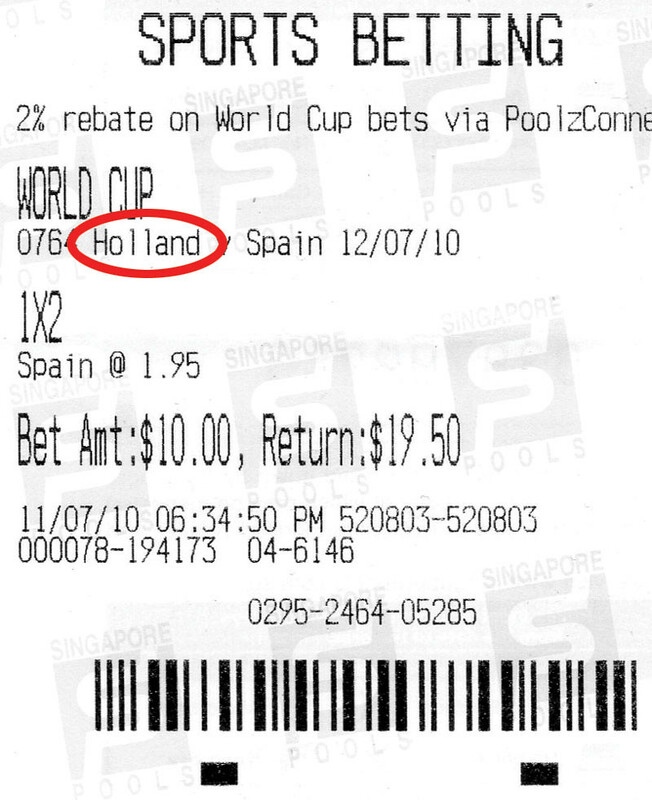 It stated Holland instead of Netherlands, which is the same as my bet slip shown above. First thing to verify is – Do Holland and Netherlands mean the same country? 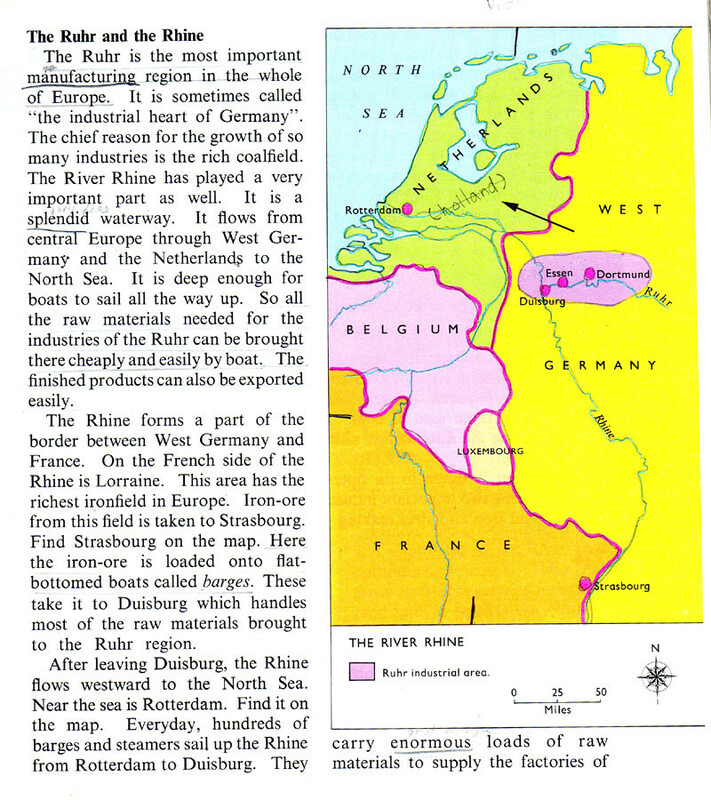 Second thing – when do we use Holland and when to use Netherlands? 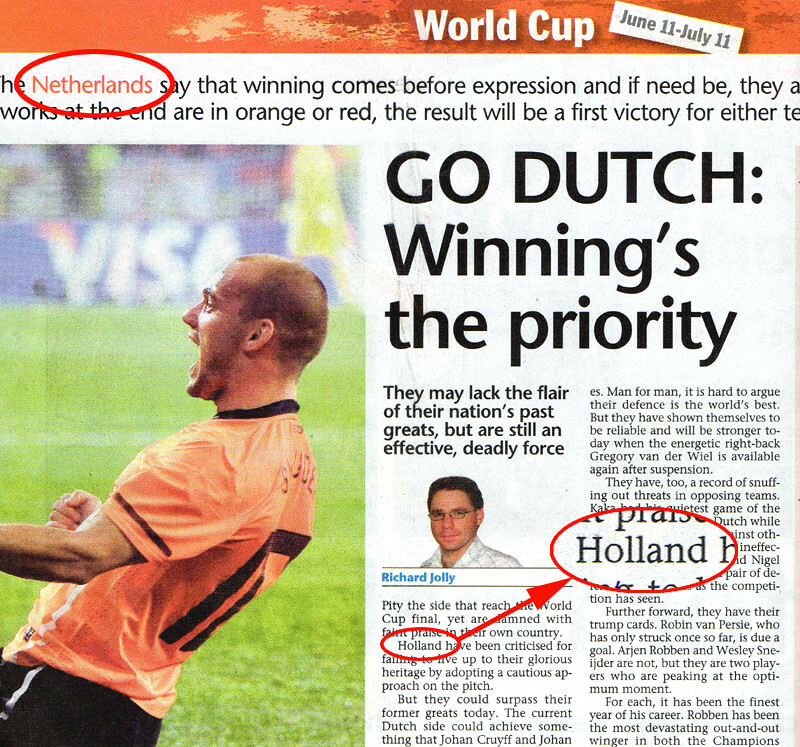 OK, first thing first – very simple : Holland and Netherlands mean the same country. Most of us use Holland to refer to Netherlands as a whole but in actual fact, Holland comprises of North Holland and South Holland which are the 2 of the the 12 provinces in Netherlands. So to be more precise, Netherlands is the country’s name and Holland is the province’s name. Now the name Holland and Netherlands are used interchangeably without one realising they are referring to the same (at least to some people like me). Now after knowing the truth, I would preferred to use Netherlands when I’m referring to the whole country. Yes I was taught Netherlands at that time but I don’t remember why I wrote the word “Holland” in bracket. To add to the confusion, Netherlands is usually referred to as “荷兰” (Holland) in Chinese. Very seldom you can hear one said “尼德兰王国” (Netherlands) – and this is very true as I’ve asked my parents and both answered me 荷兰 is the country’s name. But one thing they told me that I’m not aware of is Holland was also known as “低地国” in the past. This simply means “Low Country”, but why? This is because geographically, Netherlands is a low-lying country and thus in Dutch (the language of Netherlands) “Nederland” means “Low Land” literally. So how “low” is it – 27% of it lies below sea level and the average elevation for the whole nation is only 11 meters above sea level. Maybe we should learn from the Netherlands on how to prevent flood and build better drainage system (OK maybe our Marina Barrage pumps already from Netherlands, right?). Flood control and land reclamation have been ongoing in Netherlands and they are among the world’s leading experts in hydraulic engineering. Now where the name “Holland” comes from? The name Holland ultimately stems from the term ‘holt land’ which means ‘wooded land’. Do take note of another incorrect, fake etymology holds that it is derived from ‘hol land’ (‘hollow land’), inspired by the low-lying geography of the region. In the past, two-third of Holland’s land lay below sea level and made up mostly of mud flats and shallows, salt marshes, blackish lakes, and flood banks, and also with patches of “woodland” (“Holt Land”). 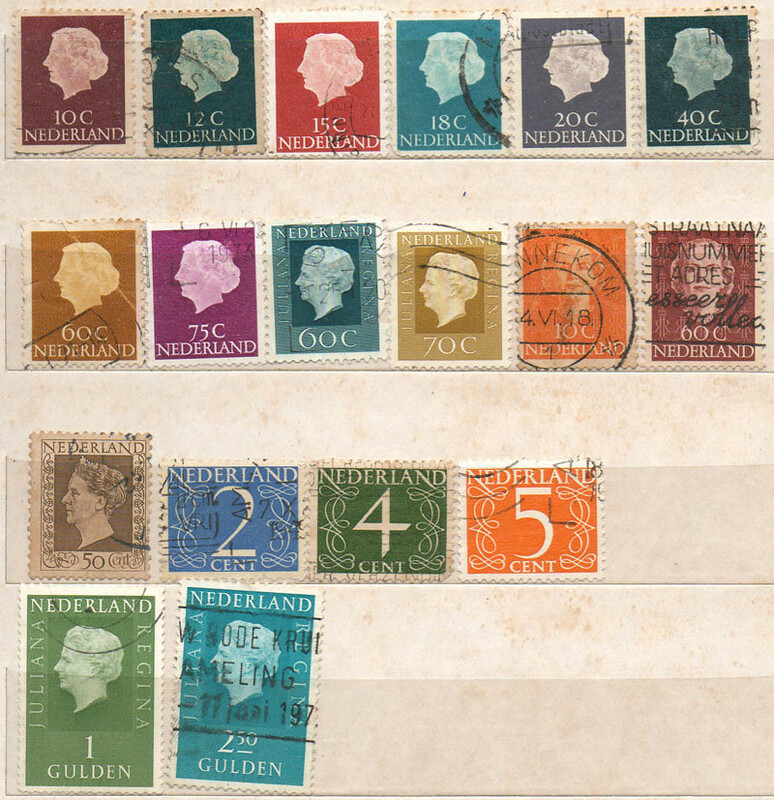 The purpose of this post is not to go into detail history of Netherlands but just a very brief explanation why the confusion on the word “Holland” and “Netherlands”. But for those who are keen to read more about Netherlands, here is a very good read “A Brief History of Netherlands“. Thus we can see that the term “Holland” is more popularly used than “Netherlands” because most traders were from the Holland province in the past. Holland was the richest and most powerful province then.